Join Global Child Forum and leading CSR business executives, policy makers, investors and thinkers at the CSR Asia Summit on September 26 – 27 in Bangkok where we will be discussing pressing challenges, emerging trends and opportunities to ‘future proof’ sustainable business. In the 1980s ballad, The Greatest Love of All, US pop diva Whitney Houston sang, “I believe the children are our future; teach them well and let them lead the way…” While she sang convincingly, this is not a new sentiment – children have always been the future. But how and whom is responsible for ‘teaching them well and letting them lead the way’, well, that’s changing. Increasingly the corporate sector is acknowledging that children, and their rights, are part of their business. They are understanding that profits and purpose are not mutually exclusive and that their growth depends not just on short-term returns but also on long-term societal gains. There is also a realisation that children’s issues are not just about charity, but about a real commitment to tackling some of the most pressing issues facing young people today; issues such as access to education, combatting sexual exploitation, online bullying, forced migration, access to clean and safe environments, and, of course, child labour. Understanding the role that children’s rights play in your business starts by recognising that children are your stakeholders – they are your consumers, family members of your employees, your future workers and leaders. Supporting and advancing their development, and integrating their rights into your operations and communities, is paramount to the success of not only society – but your business. The perils of ignoring children’s rights in your operations and along your supply chain, have also been well-documented as tales of warning. The launch of the Sustainable Development Goals last year has highlighted that business is – and must be – a driver of change if the goals are to be reached by 2030. Business is a key economic driver in the communities in which they operate, they are employers, and they are consumers of the resources – whether they be human resources or environmental. Governments can’t do everything alone and civil society continues to be hampered – but business has the know-how, the resources and, increasingly, the will to make the difference. However, this awareness must translate into real action. The Global Child Forum’s benchmark report, The Corporate Sector and Children’s Rights in Southeast Asia, provides a starting point for measuring the region’s progress – and promise — in this area. Launched last year with the Boston Consulting Group, the report evaluates nearly 300 of the region’s top companies to see how they address and report on children’s rights. The results indicate that while many companies contribute to programmes and community investment initiatives involving children’s rights, these issues have not yet made it into the board room or into strategic business analysis. “One thing that we noted is that those companies who successfully integrate children’s rights into their operations – and put them on the forefront of their sustainability agenda – have done so with the leadership and support at the board level. It must start at the highest levels of corporate governance,” says Fiona Rotberg, Global Child Forum’s Research Director. So, what can business do? The Children’s Rights and Business Principles, developed by UNICEF, the UN Global Compact and Save the Children in 2012, offer a road map for how business can approach children’s rights in the workplace, the marketplace and the community. The ten principles set out concrete actions for business to respect and support children’s rights. Rick Ramli, Partner and Managing Director from the Boston Consulting Group Malaysia offers a perspective on how to move forward, based on the findings from benchmark report: “Companies in Southeast Asia are contributing to children’s issues through strategic programmes and donating to charities. Many of us have CSR programmes that fund causes in education, health or nutrition.” While these efforts are commendable, he notes that these CSR activities are too detached from companies’ day-to-day and core operations. Here there is an opportunity for development, for example by putting in place mechanisms to ensure product safety and safe marketing as well as prevent child labour and sexual exploitation. What core actions can a company take? But what are the core actions that a company can take? A few real-life examples illustrate what’s possible: A construction company is integrating a child perspective into their worksites, taking into consideration the presence of migrant workers’ children. A leading telecommunications company goes beyond sustainability and includes education and training for both children and teachers – providing access to online learning channels. A shoe manufacturer believes in paying living wages to ensure that the children of their employees can go to school, and not enter the workforce too early. A hotel chain works with a local NGO to keep children safe and reduce the risks of child abuse and trafficking. The examples are numerous and during the month of May many of these company examples were highlighted on social media during Global Child Forum’s #30ways30days campaign. The good news is that children’s rights are becoming more relevant for Asian companies and the corporate sector is on its way to realising that championing children’s rights will unlock more markets and create both shareholder and stakeholder value. And that’s certainly something worth singing about. Global Child Forum will explore the business case for child’s rights and showcase ground-breaking research, good company examples and a range of free on-line risk assessment and planning tools at the CSR Asia Summit, 26 & 27 September in Bangkok. More details on this session will be available shortly. To register for the event go to the CSR Asia Summit website. As Communication Manager, Linda is responsible for bringing our work, and our message, to our stakeholders. She has long career in communications both in the private and public sector working for UN-affiliated organisations such as The International Atomic Energy Agency (IAEA), the United Nations Industrial Development Organisation (UNIDO and the Dag Hammarskjöld Foundation. Her public sector work is augmented by assignments in advertising, internet consulting and brand development. She holds an undergraduate degree from Barnard College, Columbia University and an MBA from the Stern School of Business, New York University. Linda joined Global Child Forum in 2015. 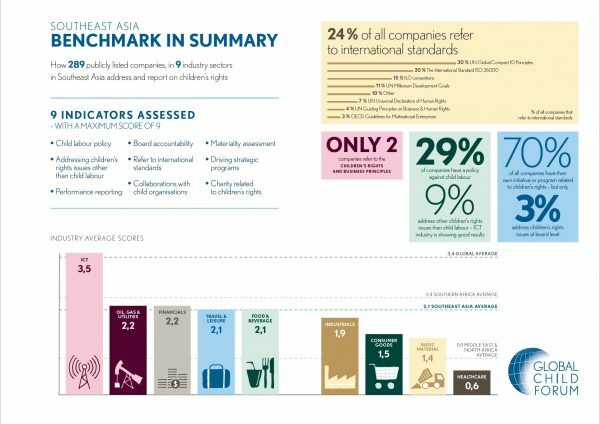 Download the Corporate Sector and Children’s Rights in Southeast Asia benchmark report. For more information on how Sime Darby integrates children’s rights into their work, read Global Child Forum’s Sime Darby Deep Dive. The Children’s Rights and Business Principles were developed by UNICEF, Save the Children and the UN Global Compact in order to offer business a set of comprehensive principles to guide them on the full range of actions they can take in the workplace, marketplace and community to respect and support children’s rights.